ISS Assembly flight. Carried the S0 truss segment to the ISS, the first segment of the main backbone of the station to which the solar arrays would be attached. AKA: Atlantis;ISS-8A. Launched: 2002-04-08. Returned: 2002-04-19. Number crew: 7 . Duration: 10.82 days. Mobile Transporter (MT). This was made by TRW Astro Aerospace in Carpinteria and was an 885 kg, 2.7 m long truck which moved on the S0 rails to transfer heavy cargo along the truss. Family: Manned spaceflight. People: Bloomfield, Frick, Morin, Ochoa, Ross, Smith, Steven, Walheim. Country: USA. Spacecraft: Atlantis. Launch Sites: Cape Canaveral. Agency: NASA. 2002 April 8 - . STS-110 Mission Status Report #01 - . Nation: USA. Related Persons: Bloomfield, Brown, Bursch, Chang-Diaz, Frick, Morin, Ochoa, Onufrienko, Ross, Smith, Steven, Walheim, Walz. Program: ISS. Flight: STS-108 ISS EO-4, STS-110. 2002 April 8 - . 20:44 GMT - . Launch Site: Cape Canaveral. Launch Complex: Cape Canaveral LC39B. LV Family: Shuttle. Launch Vehicle: Space Shuttle. STS-110 - . Call Sign: Atlantis. Crew: Bloomfield, Frick, Morin, Ochoa, Ross, Smith, Steven, Walheim. Payload: Atlantis F25 / SO. Mass: 100,000 kg (220,000 lb). Nation: USA. Related Persons: Bloomfield, Frick, Morin, Ochoa, Ross, Smith, Steven, Walheim. Agency: NASA. Manufacturer: Boeing. Program: ISS. Class: Manned. Type: Manned spaceplane. Flight: STS-110. Spacecraft Bus: Shuttle. Spacecraft: Atlantis. Duration: 10.82 days. Decay Date: 2002-04-19 . USAF Sat Cat: 27413 . COSPAR: 2002-018A. Apogee: 402 km (249 mi). Perigee: 309 km (192 mi). Inclination: 51.60 deg. Period: 91.70 min. 2002 April 9 - . STS-110 - Wakeup Song: The Best Years of Our Lives - . Flight: STS-110. "The Best Years of Our Lives" by the Baha Men..
2002 April 10 - . STS-110 Mission Status Report #04 - . Nation: USA. Related Persons: Bloomfield, Bursch, Frick, Morin, Ochoa, Onufrienko, Ross, Smith, Steven, Walheim, Walz. Program: ISS. Flight: STS-108 ISS EO-4, STS-110. STS-110 - Wakeup Song: Rapunzel Got a Mohawk - . Flight: STS-110. "Rapunzel Got a Mohawk" performed by Joe Scruggs. The song was played for Ochoa, at the request of her family..
STS-110 Mission Status Report #05 - . Nation: USA. Related Persons: Bloomfield, Bursch, Frick, Morin, Ochoa, Onufrienko, Ross, Smith, Steven, Walheim, Walz. Program: ISS. Flight: STS-108 ISS EO-4, STS-110. 2002 April 11 - . STS-110 Mission Status Report #07 - . Nation: USA. Related Persons: Bloomfield, Bursch, Frick, Ochoa, Ross, Smith, Steven, Walheim, Walz. Program: ISS. Flight: STS-108 ISS EO-4, STS-110. STS-110 - Wakeup Song: University of California-Berkeley fight song - . Flight: STS-110. "University of California-Berkeley fight song" performed by the school band and"All Right Now" performed by the Stanford University band. Ochoa requested the songs be played for crewmates Walheim and Smith who attended the rival schools. Ochoa's also a Stanford graduate. STS-110 Mission Status Report #06 - . Nation: USA. Related Persons: Bloomfield, Bursch, Frick, Morin, Ochoa, Onufrienko, Ross, Smith, Steven, Walheim, Walz. Program: ISS. Flight: STS-108 ISS EO-4, STS-110. 2002 April 11 - . 14:36 GMT - . EVA STS-110-1 - . Crew: Smith, Steven, Walheim. EVA Duration: 0.33 days. Nation: USA. Related Persons: Smith, Steven, Walheim. Program: ISS. Flight: STS-110. At 1030 UTC the S0 truss was unberthed from Atlantis, and berthed to the Destiny module's Lab Cradle Assembly at 1346 UTC. At 1433 the Quest airlock was depressurized and the astronauts emerged to bolt in place the two forward MTS struts and deploy a trailing umbilical for the mobile transporter. The airlock was repressurized at 2224 UTC. 2002 April 12 - . STS-110 Mission Status Report #08 - . Nation: USA. Related Persons: Bloomfield, Bursch, Frick, Morin, Ochoa, Onufrienko, Ross, Smith, Steven, Walheim, Walz. Program: ISS. Flight: STS-108 ISS EO-4, STS-110. STS-110 Mission Status Report #09 - . Nation: USA. Related Persons: Bloomfield, Bursch, Frick, Morin, Ochoa, Onufrienko, Ross, Smith, Steven, Walheim, Walz. Program: ISS. Flight: STS-108 ISS EO-4, STS-110. STS-110 - Wakeup Song: Testify to Love - . Flight: STS-110. "Testify to Love" by Wynonna Judd played for Bloomfield from his family..
2002 April 13 - . STS-110 Mission Status Report #10 - . Nation: USA. Related Persons: Bloomfield, Bursch, Frick, Morin, Ochoa, Onufrienko, Ross, Smith, Steven, Walheim, Walz. Program: ISS. Flight: STS-108 ISS EO-4, STS-110. STS-110 - Wakeup Song: Voodoo Chile - . Flight: STS-110. "Voodoo Chile" by Jimi Hendrix. It was played for Morin, who will be making his first spacewalk, at the request of his wife..
2002 April 13 - . 14:09 GMT - . EVA STS-110-2 - . Crew: Morin, Ross. EVA Duration: 0.32 days. Nation: USA. Related Persons: Morin, Ross. Program: ISS. Flight: STS-110. The spacewalk was from 1405 to 2139 UTC. The astronauts attached the aft MTS struts and deployed the second trailing umbilical..
2002 April 14 - . STS-110 - Wakeup Song: All Star - . Flight: STS-110. "All Star" performed by Smash Mouth from the Shrek movie soundtrack. The song was played for Walheim by his family..
STS-110 Mission Status Report #12 - . Nation: USA. Related Persons: Bloomfield, Bursch, Frick, Morin, Ochoa, Onufrienko, Ross, Smith, Steven, Walheim, Walz. Program: ISS. Flight: STS-108 ISS EO-4, STS-110. 2002 April 14 - . 13:48 GMT - . EVA STS-110-3 - . Crew: Smith, Steven, Walheim. EVA Duration: 0.27 days. Nation: USA. Related Persons: Smith, Steven, Walheim. Program: ISS. Flight: STS-110. From 1344 to 2015 UTC the astronauts rewired the SSRMS station robot arm to get power via the S0. They also removed launch restraint bolts from the Mobile Transporter. The Mobile Transporter was tested in a small move on April 15..
2002 April 15 - . STS-110 Mission Status Report #14 - . Nation: USA. Related Persons: Bloomfield, Bursch, Frick, Morin, Ochoa, Onufrienko, Ross, Smith, Steven, Walheim, Walz, Wolf. Program: ISS. Flight: STS-108 ISS EO-4, STS-110. STS-110 - Wakeup Song: Magic Carpet Ride - . Flight: STS-110. "Magic Carpet Ride" by Steppenwolf, dedicated to Smith..
STS-110 Mission Status Report #15 - . Nation: USA. Related Persons: Bloomfield, Bursch, Frick, Morin, Ochoa, Onufrienko, Ross, Smith, Steven, Walheim, Walz. Program: ISS. Flight: STS-108 ISS EO-4, STS-110. 2002 April 16 - . STS-110 - Wakeup Song: I Am an American - . Flight: STS-110. "I Am an American" performed by the Purdue University Marching band. It was dedicated to Purdue graduate Ross..
STS-110 Mission Status Report #17 - . Nation: USA. Related Persons: Bloomfield, Bursch, Frick, Morin, Ochoa, Onufrienko, Ross, Smith, Steven, Walheim, Walz. Program: ISS. Flight: STS-108 ISS EO-4, STS-110. STS-110 Mission Status Report #16 - . Nation: USA. Related Persons: Bloomfield, Bursch, Frick, Morin, Ochoa, Onufrienko, Ross, Smith, Steven, Walheim, Walz. Program: ISS. Flight: STS-108 ISS EO-4, STS-110. 2002 April 16 - . 14:29 GMT - . EVA STS-110-4 - . Crew: Morin, Ross. EVA Duration: 0.28 days. Nation: USA. Related Persons: Morin, Ross. Program: ISS. Flight: STS-110. From about 1426 UTC to 2106 UTC the astronauts deployed the Airlock Spur, a small ladder from S0 to Quest, as well as installing some floodlights..
2002 April 17 - . STS-110 - Wakeup Song: Noah - . Flight: STS-110. "Noah" performed by Steve Frick when he was a teen-ager..
2002 April 18 - . STS-110 - Wakeup Song: Somewhere Over the Rainbow - . Flight: STS-110. "Somewhere Over the Rainbow" -. STS-110 Mission Status Report #21 - . Nation: USA. Related Persons: Bloomfield, Bursch, Frick, Gidzenko, Morin, Ochoa, Onufrienko, Ross, Shuttleworth, Smith, Steven, Vittori, Walheim, Walz. Program: ISS. Flight: STS-108 ISS EO-4, STS-110. 2002 April 19 - . STS-110 - Wakeup Song: Message in a Bottle - . Flight: STS-110. "Message in a Bottle" by The Police.. Landing of STS-110 - . Return Crew: Bloomfield, Frick, Morin, Ochoa, Ross, Smith, Steven, Walheim. Nation: USA. Related Persons: Bloomfield, Frick, Morin, Ochoa, Ross, Smith, Steven, Walheim. Program: ISS. Flight: STS-110. Atlantis had undocked from ISS at 1831 UTC on April 17. It returned to Earth on April 19, with a deorbit burn at 1518:59 UTC and landing on Runway 33 at KSC at 1626:57 UTC..
STS-110 Mission Status Report #22 - . Nation: USA. Related Persons: Bloomfield, Bursch, Frick, Gidzenko, Morin, Ochoa, Onufrienko, Ross, Shuttleworth, Smith, Steven, Vittori, Walheim, Walz. Program: ISS. Flight: STS-108 ISS EO-4, STS-110. 2002 April 20 - . 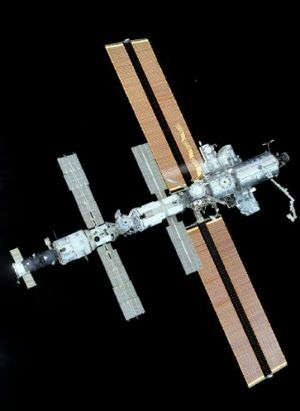 ISS Port Cleared - . Nation: USA. Program: ISS. Flight: STS-110. At 0916 UTC on April 20 Soyuz TM-33 undocked from the Zarya nadir port carrying the Expedition-4 crew. It redocked with the Pirs nadir port at 0937 UTC. This cleared the port Zarya port for the pending Soyuz TM-34 launch..